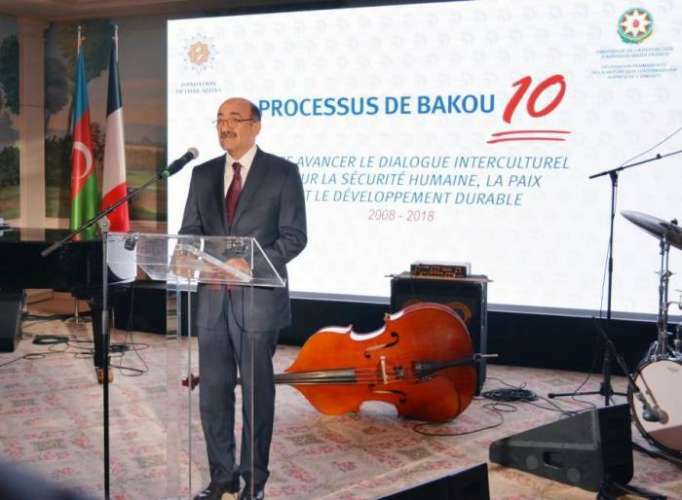 The 10-year anniversary of the "Baku process" has been celebrated in Paris, with the support of the Heydar Aliyev Foundation, the Azerbaijani Embassy in France and the Permanent Mission to UNESCO. The audience was informed about the "Baku process", and it was noted that this platform was put forward by the initiative of Azerbaijani President Ilham Aliyev in 2008 to carry out more specific activities in the field of dialogue between cultures and religions. For more detailed information about the "Baku process", the floor was given to Minister of Culture of Azerbaijan Abulfaz Garaev. The minister expressed gratitude to the Heydar Aliyev Foundation, the Embassy of Azerbaijan in France and the Permanent Mission to UNESCO for organizing such an important event. Garayev noted that this year marks not only the 10th anniversary of the "Baku process", but also the 100th anniversary of the Azerbaijan Democratic Republic. The minister said that representatives of different religions have been peacefully coexisting in Azerbaijan since ancient times. He stressed that over the past ten years political, religious and cultural leaders of the countries of the world have been gathering in Baku. It was noted that in order to promote intercultural dialogue in 2008 at the conference of Ministers of Culture in Baku, Azerbaijani President Ilham Aliyev put forward the "Baku process" initiative. In 2010, at the 65th session of the UN, the call of the President of Azerbaijan to hold the World Forum on Intercultural Dialogue turned the "Baku process" from a regional initiative to a global one. The idea of holding the World Forum on Intercultural Dialogue has been supported by such influential international organizations as UNESCO, UN Alliance of Civilizations, World Tourism Organization, Council of Europe, and ISESCO, and the first Forum was held in Baku in April 2011. A total of 6,000 representatives of states and governments, heads of international organizations, ministers of culture and ambassadors, parliamentarians, diplomats, representatives of NGOs and media, journalists and experts took part in the Forum, which has been held every two years since that year. Garayev spoke about the international events held in Azerbaijan. He brought to attention that the 7th Global Forum of the UN Alliance of Civilizations, held in Baku in 2016, was attended by 3,000 representatives from 147 countries. In the resolution entitled as "Promotion of interreligious and intercultural dialogue, cooperation in the name of mutual understanding and peace", the UN General Assembly highly appreciated the "Baku process" and called it an important global platform to support intercultural dialogue. Garayev added that this year the Azerbaijani government decided to combine with the "Baku process" another important international event - the Baku International Humanitarian Forum.